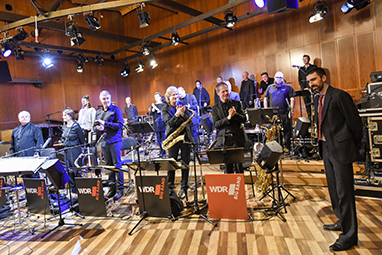 On November 29, 2016, the WDR Big Band performed a program of six of my compositions to a packed house at the WDR Funkhaus in Köln. Here I was, an Argentinean who had come to New York 20 years prior, conducting one of the great big bands in the world - in Germany! The pieces on this recording are in the order they were performed at the concert. La Ley Primera (“The First Law”): This piece is inspired by the famous long poem "Martin Fierro" by José Hernández (1834 1886), and Argentinean children grow up familiar with many quotes from it. One of my favorites is “Los hermanos sean unidos, porque esa es la ley primera, y si entre ellos se pelean, los devoran los de afuera” (“Brothers should be united, because that’s the most important law, and if they argue, they will be devoured by outsiders”). This is one of the simplest tunes I have written in a long time; it's based on the Argentine rhythm and form of the zamba, almost unaltered, and features mainly one voice: Johan Hörlén on alto sax. 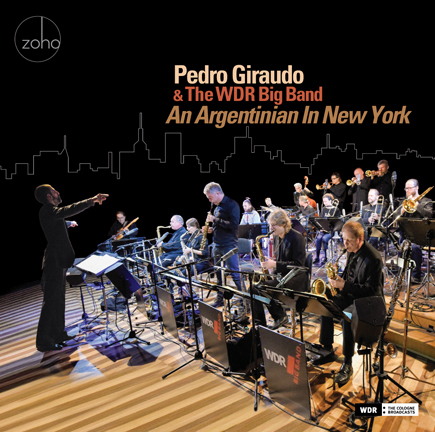 Pedro Giraudo & The WDR Big Band. Photo by Ines Keiser. An Argentinian in New York is ultimately about a man, a maestro’s search for meaning in his adopted home. Hailing from Cordoba, Argentina, Pedro Giraudo is a celebrated and virtuoso bassist, bandleader, composer, and arranger who is a veritable creative genius. His musical career reads like an all-star lineup, as he’s performed or recorded with the likes of Ruben Blades, Paquito D’Rivera, Pablo Ziegler, Regina Carter, Branford Marsalis, among others. His discography as a band leader is equally as impressive, having released five albums that are all critically acclaimed. On the ZOHO label, they include “Cordoba” (ZM 201106, Downbeat **** 4 stars), “Cuentos” (ZM 201503, Downbeat *** 4 stars), and the upcoming “Vigor Tanguero” (ZM 201803), simultaneously released with “An Argentinian in New York”. Moreover, Giraudo leads three bands: a big band, jazz orchestra, and sextet. No doubt, he is prolific, but not at the expense of quality, as he crafts his compositions with painstaking detail and renders his big band harmonies with sophistication akin to the great Duke Ellington. His music both honors long-held traditions while also advancing a new sound that fuses his sparkling ideas with the remarkable musicians found in New York. Those in the music world know, when Pedro calls, the grandmaster is on the line. On this album, Giraudo observes, describes, and explains New York through a colorful and multi-hued musical prism. For those new to the Big Apple, as well as lifelong residents, you will hear something new, fresh, even provocative in these seminal pieces. That’s because Giraudo imbues his music with both personal and profound meditations on the meaning of home. He realizes and furthers the notion that blending is beautiful, mixing is magnificent. Indeed, this album could have very well been titled “Melting Pot,” invoking that vivid American metaphor, as Giraudo explores his native Argentina (for example, “Chicharrita” an homage to tango master Osvaldo Pugliese) with subtle references and overt rhythms, juxtaposing it with the musical modernity of American urban living (for instance, “Eir,” which draws attention to the struggle of women not just in the jazz world but across most sectors and industries). Giraudo has something to say. And this production is a personal testimony on the challenges and opportunities of our time. Six of Giraudo’s brilliant compositions are brought to life with the spectacular performance of the WDR Big Band. Like a well-oiled machine, these musicians hit each note with precision, and the respective brass and reed sections fall into place like pennies finding their slots. Here you have a bandleader operating at the top of his game, paired with arguably the best big band today. Recorded live on November 29, 2016 at the Klaus von Bismark Saal in Cologne, Germany. Producers: Pedro Giraudo, Kabir Sehgal, Kenya Autie. Production coordination: Lucas Schmid. Art Direction and Package Design: Jack Frisch. Liner Notes: Kabir Sehgal. Executive Producer: Joachim “Jochen” Becker. A Westdeutscher Rundfunk Cologne Production, 2017. Licensed by WDR mediagroup GmbH. All compositions composed and arranged by Pedro Giraudo. Publisher: Pedro Giraudo Music, BMI.